The pinfold in the centre of Huncote was renovated by the Parish Council in 2008 and dates back hundreds of years. The site of the Pinfold at Huncote is on Main Street. 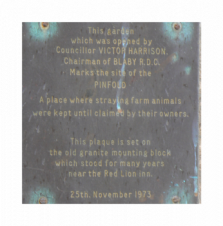 In 1973 a garden was opened on the site and a plaque set on an old granite mounting block which had stood for years near the Red Lion public house. The Chairman of Huncote Parish Council, Mr Alex Knight, invited the children of Huncote County Primary School to cut the ribbon to offically re-open the refurbished Pinfold. The now reclaimed pinfold can be used by any member of the village as a place of rest and relaxation. Children may use it as a meeting place, somewhere they chat and eat their ice creams. Everyone at Huncote School hope that people will respect the history of this special area and look after its environment.